We welcome all inquiries about membership . . .
Marsha Nehiley is the chairperson of our Membership Committee. As a long-term member of Congregation Agudath Achim, she’ll be able to start the conversation about membership. We work hard to make it possible for Jews to be a part of our community. Just ask! How do I become a member of Congregation Agudath Achim and The Jewish Community House? What’s the process? We’d love to have you join us. Just e-mail our Membership Committee Chairperson Marsha Nehiley at jewishtaunton@gmail.com for more information and a membership packet. Why should I join Congregation Agudath Achim? Congregation Agudath Achim is home to a diverse, friendly group of people. At Agudath Achim, we support one another with a caring community and a culture of inclusiveness. We have weekly Shabbat services, adult education, religious school for children, teen programming, a great Sisterhood, a super preschool family education program, a burgeoning group for men “Just the Guys” and, always, great opportunities to meet other people. I’d like to join, but I don’t know anyone at Congregation Agudath Achim. We have lots of opportunities for getting involved and meeting people, starting as soon as you join. Check out our Calendar and request a copy of our monthly newsletter “Kol HaKahal – Voice of the Congregation”, to see the events taking place. The best way to get to know people is to get involved. While many of our members live in Taunton, we have just as many, if not more, who live in surrounding communities. Why should I join now? My child is only two years old. It is never too soon to be a part of the Jewish community. While we often think that synagogues are around to “teach Judaism” to our children, there is so much more. Synagogues provide ongoing opportunities to study, experience, and enjoy being connected to a Jewish community. Plus, our Shalom Kids preschool family education Sunday morning programs meet twice a month and are more than just educational, they’re fun and they allow you to meet other young families. You can try these programs out for awhile before deciding to join. My kids are grown. 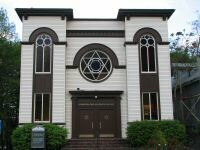 What do I need a synagogue for? While we offer many family-oriented programs that does not mean that we are only open to families with younger children. We focus on community building, with Sisterhood, Just the Guys (Men’s Club), adult education, social action programs, leadership opportunities and, of course, worship experiences. The synagogue’s task is to enhance your connection with other Jews and your personal search for meaning. What does it cost to join a synagogue? Isn’t it expensive? A Jewish sage once said that “the Gates of Prayer are always open.” Congregation Agudath Achim is committed to keeping our gates open and inclusive to all. While Agudath Achim has expenses like any other organization, we strive to ensure that financial constraints are never an obstacle to membership. Confidential discussions on reduced dues are encouraged if that will help you and your family join. First year dues are offered at a discount to help ease you into the financial responsibilities of membership. Do you welcome and support interfaith families? Many of Agudath Achim’s current member families are interfaith. We welcome members from diverse backgrounds. Learn about Congregation Agudath Achim by coming to be with us. Join us at Shabbat services; come to a Shabbat Rishona (first Shabbat of the month – a family oriented service; attend Torah study on Saturday mornings; meet with the Rabbi, our staff, and our welcoming congregants. You can find out upcoming events on our website calendar. Email Marsha Nehiley for more information at jewishtaunton@gmail.com.